Acute renal failure and chronic renal failure are two health problems that commonly affect cats. Acute renal failure can affect cats at any age; emergency care is essential to treating this condition and saving a cat’s life. Chronic renal failure typically occurs in senior cats. According to the American Association of Feline Practitioners, 49% of all cats over the age of 15 are affected by chronic renal disease. With the diagnosis of kidney problems and renal failure in cats increasingly common, it is essential that cat owners learn the symptoms of this disease and how best to manage the disease. Kidneys play a critical role in day-to-day functions. The kidneys remove metabolic waste from the blood stream, and produce vital hormones that help control blood pressure and stimulate red blood cell production. The kidneys follow a complex system for managing and regulating waste; when this system breaks down, severe complications may occur to a cat’s other organs that can ultimately lead to death. Chronic renal failure is an incurable condition primarily affecting older cats. It is often the end-stage for other health problems, such as advanced dental disease or a kidney inflammation/obstruction. Thanks to veterinary care advancements, however, with early diagnosis and proper treatment, it is often possible to give the cat a good quality of life for many years. Treatment for renal failure depends on the condition’s cause and severity. In the case of acute renal failure, if a kidney is blocked by an obstruction, it may be possible to surgically remove the blockage and correct the problem. For chronic renal failure, treatment focuses on diet, fluids, and medications to control secondary problems, such as high blood pressure and anemia that may occur. There are many brands of diets made for kidney problems in the cat; all have a reduced amount of protein and phosphorus, and may have added potassium. Talk to your veterinarian before changing your cat’s diet. The main treatment for both kinds of kidney failure is fluids. Hospitalization with intensive fluid therapy is required for acute kidney failure, and often also used for the more severe stage of chronic. 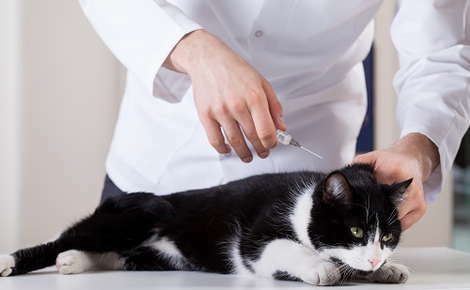 Once the cat is stabilized, many veterinarians will have you give fluids subcutaneously at home. They will teach you how to give the special fluid under the skin. Cats are surprisingly tolerant of this. Other medications may include appetite stimulants, stomach acid reducers such as Pepcid, phosphate binders, potassium supplements, and injectable erythropoietin, which is used to stimulate red blood cell production in the anemic cat. It is very common for cats with kidney problems to have high blood pressure, and therefore need hypertension medication. While kidney problems are very common in they cat, the disease can often be managed well for many years.